I needed some workout shorts, as it is getting way to hot to wear pants to the gym, so I stopped by Old Navy to see what they had. Unfortunately I was unable to get any shorts as they were all for running, but I did find some really great workout tops. This top is really cool because it has an open back all the way down to the lower back, it is great for outdoor workouts as you will have plenty of breeze. This was a top that I got for $2.50, its a simple navy and grey striped tank and I really like the fit, it doesn’t hug my muffin top too much. This “Love Summer” tank was on sale for $7 and it is made of really soft light material and hangs really nicely on me. They only had 1 sports bra in my size and it was on sale for $10 I think, I wanted one that didn’t have the pad inserts because I am tired of fighting to get them in and out, I wish I could find one that had the liners sewn in, if you know of any please leave the link below. The back of this racerback is pure mesh, but you can’t see through it. This “Take Me To The Beach” tank is just like the teal one above and I really like the color. I love this knotted racerback it looks like it has such a crazy pattern but it is actually quite slimming which is really nice. When I was taking these pictures I turned around and Louis was asleep on the vacuum, which worked out nicely for me because then I had an excuse not to do the floors lol. 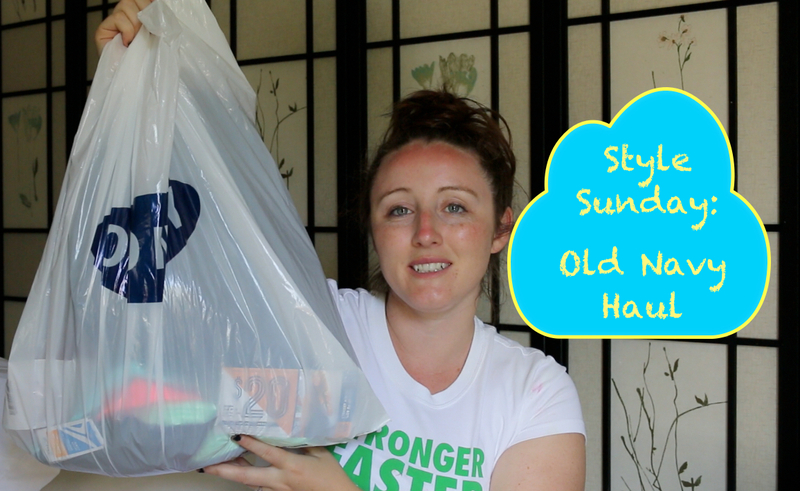 If you would like to see the full Haul Video it is below…..